Resident Work Hour Limits: Should They Be Extended? An 18-year-old woman was taken to the ER of New York Hospital on March 4, 1984. Suspecting she had a viral syndrome after presenting with a fever and jerking movements, physicians admitted her for observation and hydration. As the night wore on, however, the woman became more and more agitated, leading her doctors — a first- and second-year resident and an attending — to order additional medications and restraints. A few hours later the woman was dead. This was the infamous case of Libby Zion, and it forced the medical establishment to take a hard look at resident work hours and supervision due to errors made during her care. Before work hour restrictions were implemented, it wasn’t uncommon for residents to stay awake for upward of 36 hours. In 2011, the Accreditation Council for Graduate Medical Education (ACGME) limited resident shifts to 16 hours, but the ACGME proposed in late 2016 that the shifts be extended to 28 hours. The council argues that the new proposed hours could improve patient care because the number of times a patient is handed off to a new resident is reduced. In an article in Stat, Dr. Christopher Lee Bennett reports on something that may not be that surprising: Most residents are working longer than the allotted hours and not admitting it. Why are residents exceeding their hours? They need to finish patient notes and charts, or they feel external pressure from their attending or other authority figures. Dr. Jennifer Adaeze Okwerekwu felt that pressure after finishing her workday and handing off a case to the night team, and working long shifts left her feeling stressed. “After just two weeks on these ICU hours, already I felt unbalanced. My life outside the hospital was put on hold. The more time I spent caring for my patients, the less I cared for myself. I didn’t have time to cook healthy meals, exercise or even spend quality time with my family,” she explained. Despite a study showing no difference in mistakes or patient deaths when surgical residents had less restrictive hours, Bennett argues the profession needs to first address the guilt and pressure that drives residents to work longer hours. Adaeze Okwerekwu notes that it’s nearly impossible to maintain a work-life balance as a physician. What are your thoughts on resident work hour limits? Should they be extended? 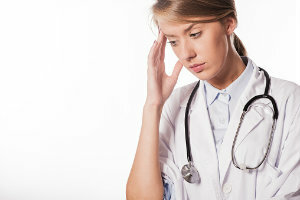 Are residents at your facility feeling pressure or guilt at the end of their shifts? Log your comments in the section below.